Vivint agreed to pay civil penalties plus restitution to 50 Missouri customers who were victims of the company’s deceptive practices, Missouri Attorney General Chris Koster announced. SPRINGFIELD, Mo. — Vivint will pay $15,000 in civil penalties plus $50,000 in restitution to 50 Missouri customers who were victims of the company’s deceptive practices, Missouri Attorney General Chris Koster announced. A Springfield woman, Edra Banks, complained about the company to the News-Leader in July 2014. Banks, 88, said a Vivint sales representative claimed to be updating her system for her previous provider, Atlas Security of Springfield, according to the newspaper. She didn’t realize until later that he had installed inferior equipment and signed her up for a different security service at a higher rate, according to the article. Banks was able to secure a refund and have her previous security system quickly restored. But dozens of other complaints against the company prompted the Attorney General’s Office to take action. Some consumers also complained that they were misled about what would happen if they canceled their previous contracts. Vivint also automatically renewed some contracts without customer consent. • Modifying written contracts so that customers’ service is extended on a month-to-month basis once the initial contract term ends. Home security systems these days are becoming increasingly affordable owing to the advancements in camera technology and manufacturing systems. Instead of hiring multiple security guards to monitor various areas of your business or establishment, you can simply hire a few security personnel to monitor the CCTV system that scrutinizes the whole premise. This heavily reduces the cost of manpower. Also, the system just needs a one-time installation cost making your entire security system very cost efficient. CCTV systems are highly effective, be it in the area of public surveillance or private security. In various cities, CCTV cameras and security systems have helped in reducing the crime rate in the monitored areas. A study commissioned by UK’s Home office revealed that the areas where CCTV security systems are installed, crime rates have come down owing to the surveillance. Burglary in houses with CCTV system is far less than in houses with not. Also, employee cheating in offices and student misbehavior at schools and colleges has reduced because of the monitoring system. People tend to behave properly when they know they are being monitored. Thus, security systems have proved to be very effective for whatever purposes they are used. With the advancement in technology, security footage monitored through closed-circuit system can be accessed in many formats. The most basic form is the delivery of footage to a traditional desk with monitors, watched by security personnel. However, that is not the only form; the security system can also be monitored online via internet, allowing the supervisors to monitor their homes and business from anywhere in the world. Also, technology has given rise to the need of mobile supervision, and thus, some CCTV systems can also be monitored via internet on mobile devices. That’s real flexibility! CCTV security system technology and CCTV equipment can be used in both internal and external environments to watch over and protect people, property, vehicles and valuables. CCTV security system is considered to be the most effective method of reducing crime.CCTV equipment can provide instant alerts when problematic trouble occurs, ensuring that crime against people, theft and vandalism are all substantially reduced and covered. And when crime does occur, CCTV security system incident recording can provide valuable evidence, improving the likelihood of a conviction. CCTV security systems and CCTV security cameras can be bought in in an endless variety of configurations, sizes, and functions, you can choose your system based on your needs. In addition, as your business grows, it's easy to expand your system for more coverage as you need it. And because this technology is so inexpensive, you can grow your system as you need to, without the worries about expense, flexibility, or storage space traditional systems might give you. “Operation Save-A-Life” was created to combat the rise in fire related injuries and deaths due to home fires in our great state. The goal of this statewide initiative is to dramatically reduce these fire related injuries and deaths across the State of Louisiana by providing smoke alarms to vulnerable citizens and at risk communities with the help of your local fire department. 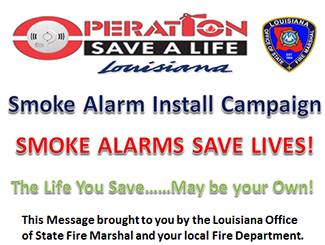 The Louisiana Office of State Fire Marshal is proud to present “Operation Save A Life”, a public service campaign designed to increase awareness and educate consumers about the dangers of fire, its related hazards and how to prevent them. Unattended cooking accounts for 1/3 of such fires. Electric ranges/stoves have a higher risk of fires, deaths, injuries and property damage compared to gas/ranges/stoves. Smoking materials (i.e. cigarettes, cigars, pipes, etc.) are the leading cause of fire deaths in the United States. In years 2002-2005, roughly one of every four fire deaths was attributed to smoking materials. Older adults are at the highest risk of death or injury from smoking material fires even though they are less likely to smoke than younger adults. Most common material first ignited in home smoking-material fire deaths were mattresses, bedding, and upholstered furniture. Candle fires accounted for an estimated 4% of all reported home fires in 2005.